Gold’n Hawk stood 44" at the withers and typically ran around 325 pounds of fast-moving muscle and bone. Hawk was working and playing with both Gwen and Jim, and we all looked forward to many years of mutual fun on the trail. Hawk’s unusually long stride coupled with his uncommon strength (not to mention his love of “getting out” and inate unflappability) made him a natural choice for a harness llama, but things did not work out that way. Gold'n Hawk died unexpectedly of extensive mysterious intestinal lesions despite OSU-VTH's heroic efforts to save him. We first saw Gold’n Hawk at a llama show (he did not attend many; it was a lucky coincidence for us) and were impressed by many of his physical attributes: Heavy bone, short and coarse standard classic coat, sensible disposition (despite being a young and hormonal stud), phenomenal muscling, and huge reaching stride. We later scrutinized him carefully at his home, including walking him up and down an extremely steep grade side-by-side with Ranger Dusty. The end result at the time was that we purchased a breeding for Lost Creek Ranger Olallie. We both knew that Hawk’s sire was only a partial shedding curaca (inherited from Hawk’s paternal grandsire, a curaca Bolivian import) and that the otherwise pure classic lines on his dam’s side did not cancel out any recessive and undesirable nonshedding traits inherited from his sire. Indeed, Lost Creek Ranger Skaikeek (the result of that breeding) was a remarkable both physically and mentally … and with his grandsire’s partially-shedding curaca coat. 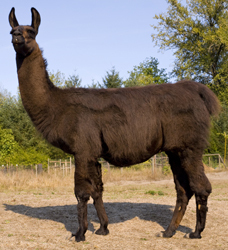 We had yet to find any other llama with Hawk’s physique, let alone one who throws it consistently and bought a shedding, short-coated daughter, Eagle’s Nest Graehawke. When Sharron Griffith of Eagle’s Nest Llamas let us know that she was drastically downsizing her small herd, we only hesitated momentarily (to weigh the practicalities of another stud on the farm!) before telling her, YES, we really wanted to have Gold’n Hawk. Gold’n Hawk completed three Master level trials towards PLTA certifications before his death. All three were complete speedily and handily, without any prior conditioning other than weight control at home. Hawk would have entered (and, obviously, completed) a fourth trial during 2010, but his huge reaching stride caused him to accidentally step on his out-of-shape handler (Gwen) on an uphill grade at the first double trial, and ... no handler, no trial. There was no doubt amongst any who hiked with him that Hawk would have earned "PLTA Extreme" certification with ease. A very representative photo of Gold’n Hawk (taken at his previous home) is used as an example of “unathletic” conformation by the NACA screening group; they teach that the photo clearly shows a llama that is short-strided and NOT capable of endurance nor moving out on hills (wow, would we ever have liked to put a few of those know-it-alls in front of Hawk on an extended uphill grade!!!). Although the negative energy from these folks is not appreciated, it is certainly valuable to have experienced the shortcomings of the NACA screening standards and methods first-hand. Cria coats fade much more than adult coats, especially the underwool, which is initially bleached by amniotic fluid, then exposed until the guard hair lengthens and finally completely covers it. At weaning, Hawk’s dun (grey-brown) baby coat had faded to a soft golden color … hence his registered name. Any gold in his adult dark dun coat was limited to guard hair highlights, but he was a truly “golden” animal in many other ways. Gold'n Hawk entered and completed one PLTA Advanced Pack trial and three PLTA Master Pack trials before his death.